The talented and friendly woman that was tending the restaurant on the night we visited only alluded to the similarities with Ethiopia when I asked her about what might be specifically Eritrean about this place. This was not the answer I wanted of course, since the city has a decent amount of Ethiopian restaurants, but the two countries were the same up until 1991. The name is thoroughly Eritrean though of course, its namesake being the large port city on the Red Sea. "What we have is some seafood dishes that other restaurants do not" she said, turning the menu over and pointing out the seafood section. This should not come as a surprise, as the Red Sea is full of fish and Eritreans anywhere close probably choose to eat them. We took notes. 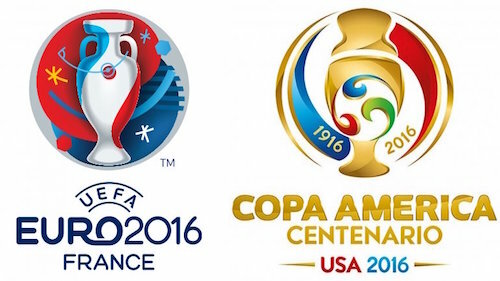 In fact there are many differences, and feel free to read all about the civil war fought between the two now very separate countries. One similarity though is beer, and thankfully Massawa has one from each country. 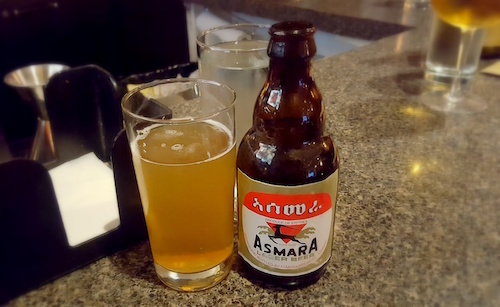 New to me was Asmara (below), named for the capital of Eritrea, a lager less malty and sweet than more familiar St. George from Ethiopia. The place also has an extensive wine list, including a nice "Ethiopian" honey wine that says it is bottled upstate. 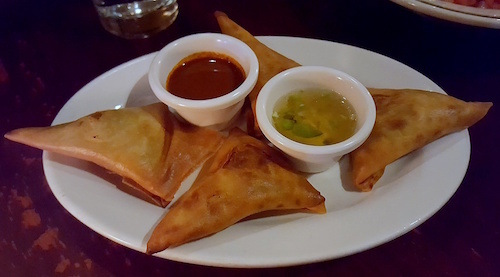 We combined an order of beef sambusas ($9, below) with vegetable sambusas ($8, below), giving us a total of four triangles to spread to the group. The crispy thin shell has four layers and is much like Middle-Eastern phyllo dough, and while both versions are quite tasty, I think the price point is too high for what you get. 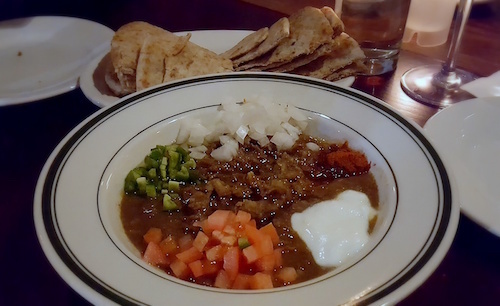 Equally or possibly even more delicious, and much better value, is the ful ($10, below), a fava bean dip that includes various vegetables, yogurt, and plenty of berbere spice so you can make the tastes you prefer. Ful is a dish of Egyptian origin, or possibly Sudanese, but has made the trip to other Middle Eastern and African countries where it is slightly adapted to local tastes. The Ethiopian/Eritrean version of course must include berbere, the famous spice mixture of the countries. This "dip" is served with toasted pita bread. In Ethiopia and Eritrea, ful (or shahan ful) is a dish commonly eaten for breakfast. 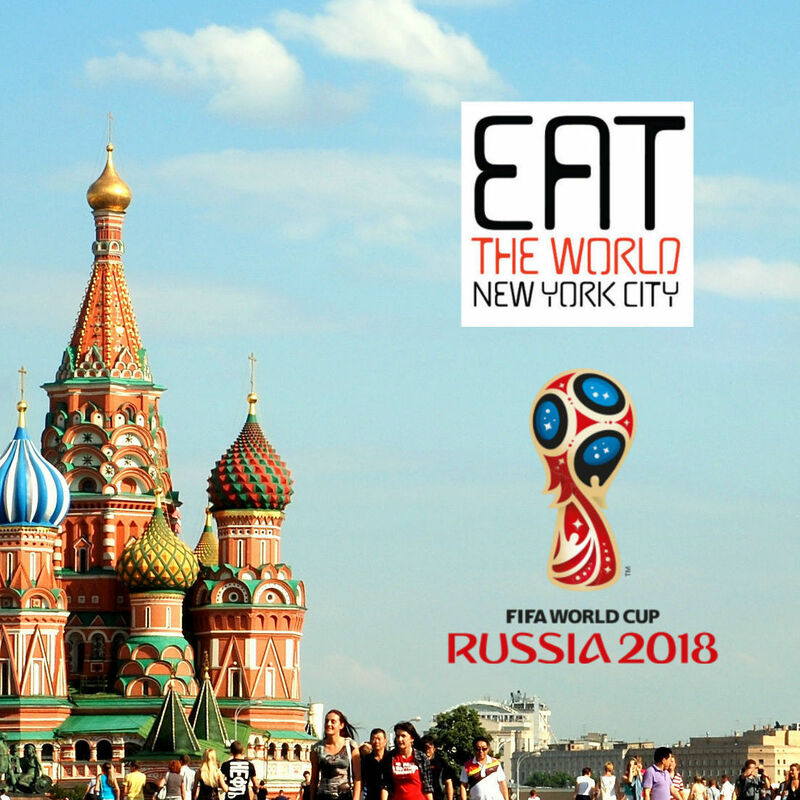 You may find it with a roll of Italian style bread or with injera. Either way, the vehicle is just the background. The dish is recommended. The rest of our meal, as is customary, arrived on one large plate for our table to share. 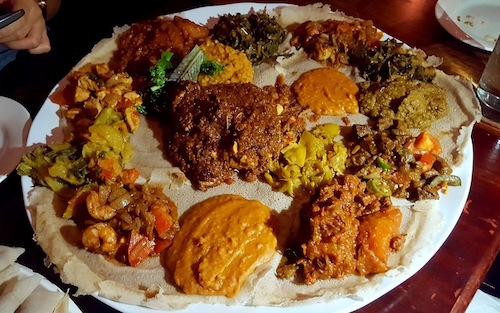 Since it is hard to pinpoint everything from the photo, the list of what we had was as follows: Massawa combo ($22.50, mild lamb, spicy beef, and chicken tebsi), veggie combo ($19.50, shiro, alitcha, and tsebhi hamli), duba b'siga ($18.50, pumpkin with beef), tsebhi derho ($18.50, dark chicken and egg with berbere), and shrimp tebsi ($22.50, shrimp with tomatoes, onions, peppers). That's right! One hundred dollars worth of delicious, berbere-laced foods came out on one plate. 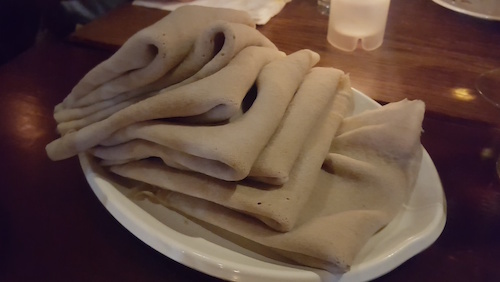 Underneath everything is a couple layers of injera, which is also served separately (below), and is used as the utensil. The trick is to not eat too much and fill up too quickly, saving space for all the variety on the plate. It was very dark in the restaurant by the time this photo was taken, so I asked for added light from a friend so that all the color would show up. I am not well-versed enough in the cuisines of East Africa to pick out every taste and ingredient, but it was noted by everyone that the tsebhi derho was the favorite. This dish was recommended to us, and is the dark mound right in the center. Before the meal, I jotted down the colors and tones I saw in the restaurant. When the big communal plate came out, it was striking how similar the colors were to the place, earth shades mostly orange and brown with some green mixed in. There is something to be said about this way of eating, these colors, these textures, and the communal plate. There is a connection to the food, and to the friends or family around you. I could not quite pin down this feeling while we were eating, but an appreciation overwhelmed me. I came to Massawa not expecting much. Some good friends whose opinions I value highly were just humdrum about the restaurant. Open since 1988, maybe they went through a lull, because in 2016 the place has sorted itself out and was packed full of patrons from East Africa and beyond.